1. Fixed: Grammarian PRO2 RTF clipboard bug. Grammarian PRO2 would sometimes paste corrections in the styled text format instead of the RTF format. 2. 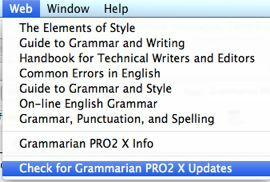 Fixed: Grammarian PRO2 Checkmark Input Menu submenus: Interactive Checking, Grammar Writing Style, Spelling, and AutoType. The input menu (checkmark) submenus now fully function under Mac OS X versions 10.6 through 10.11. 3. Fixed: Interactive Checking Popup Menu and Interactive Checking Floating Window cancel and close when backspacing past the error word or phrase. 4. 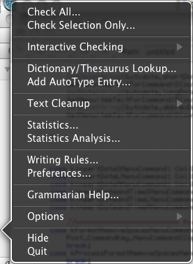 New: Interactive Checking and Text Cleanup items in Grammarian app Dock Menu. 5. New: Grammarian PRO2 Input Menu and Pencil Menu and associated submenus redesign. This eliminates 'IMK Stall' issues on Yosemite and El Capitan with slower Macs. 6. New: Grammarian PRO2 Alert Notification Window for any system failure to receive requested clipboard text formatting. This usually occurs with low system memory. Often, checking extremely large manuscripts could trigger this. 7. New: Grammarian PRO2 Uninstaller features: Reset Grammarian PRO2 Input Menu button. 8. Fixed: Spelling dictionaries are now loaded into memory immediately after being installed into the Writing Rules/Spelling List pane. 9. Fixed: Grammarian PRO2 Input Menu "Quit Grammarian" and "Open Grammarian" menu item. 10. Fixed: Apple Pages Smart Quote RTF formatting issues. 11. Fixed: Rare hang on file search and file copy on new installations. 12. Fixed: Capitalized phrases in Personal Phrases dictionary. 13. Fixed: Grammarian PRO2 now automatically updates and reloads dictionaries that are edited in the Grammarian Editor. 15. Fixed: Rare crash in Input Menu activation. 16. Updates: Spelling dictionaries and grammar parts dictionaries updates. 17. Fixed: Various grammar error parsing issues. 18. New: El Capitan compatibility fixes. 1. Fixed: Phrasal modal verbs, semi-modal verbs, and idiom verb exceptions with "to" as part of the verb error. Example: The plane was supposed to raise up. 2. Many other parse engine fixes.